Charming storefronts and colossal hanging flower baskets line Front Street in Lynden, Washington. But the farming community’s award-winning main street is more than just a quaint street scene. 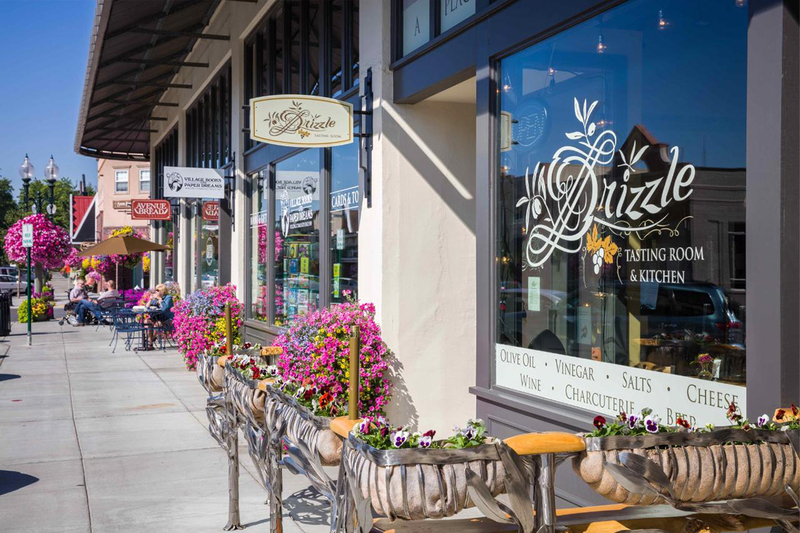 Lynden, located near the Canadian border in northern Whatcom County, is thriving thanks to community-minded business owners who are working together to make the small town a welcoming home for residents and an idyllic getaway for visitors. “If you haven’t been to Lynden, it’s time,” says local business owner Teri Treat. Relax in the cozy comforts provided by the Inn at Lynden, or borrow a bicycle from their fleet to explore the area at a uniquely Lynden pace. 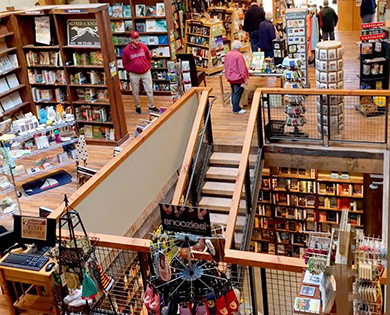 Village Books—a tradition in Bellingham's Fairhaven district for over 30 years—has opened a new store in Lynden's Waples Mercantile Building. 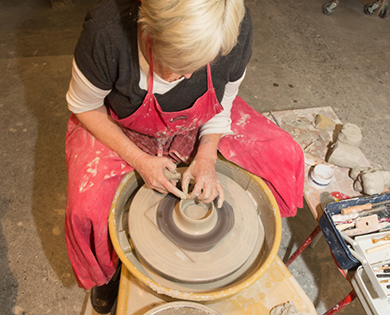 The Jansen Arts Center provides classes, and features regular gallery exhibitions and performance art events. A major turning point was redevelopment of iconic Front Street buildings. The non-profit Jansen Art Center led the way with a loving community-supported renovation of the former city hall. 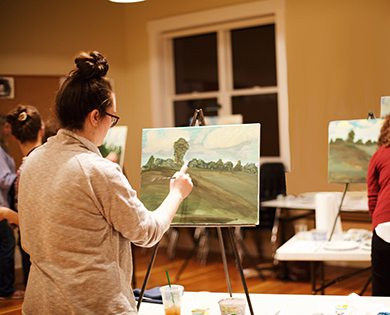 Once the place where locals paid their water bills or spent a night in jail, today the J’s warm wood floors lead to exhibits, concerts and workshops for hands-on engagement with the arts. Three years later, business partners brought the landmark Waples Mercantile Building back to life, earning a spot on the National Registry of Historic Places. 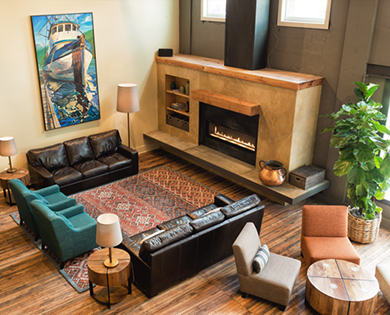 The century-old concrete and heavy timber structure nearly burned to the ground in 2008, but now it is a modern-day downtown anchor housing the Inn at Lynden, independent bookstore and gift shop Village Books and Paper Dreams, a taproom, restaurant, and two additional local retailers. “We let the building lead the design work,” says Teri Treat with the Inn at Lynden. “It’s a working man’s building. Masculine, strong.” The inn’s 35 guest rooms blend feminine touches with the building’s handsome warmth. Each over-sized room has high ceilings, natural light, luxury bedding and super soft towels. Just like the Jansen Art Center and Waples Building, partnerships are behind new downtown events. The Lynden Downtown Business Association created the Hot Thursday Night series, July 26, Aug. 2 and Aug. 9. 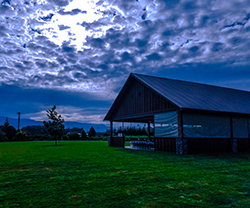 Family activities include a Night Market, outdoor movies and live music at the Jansen Art Center. In addition to the new attractions, Lynden has popular traditions like the June 2 Farmers Day Parade, the Raspberry Festival in July, the Northwest Washington Fair in August, and the Lighted Christmas Parade the first Saturday in December. But, there doesn’t have to be a major event to make a trip to Lynden’s Front Street worthwhile. 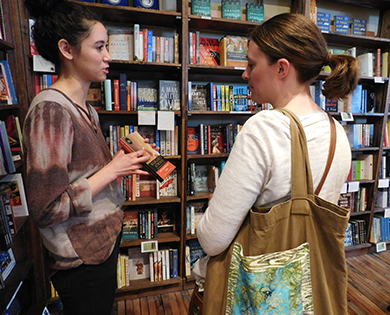 Village Books–whose flagship store is in Bellingham’s historic Fairhaven district–regularly hosts author readings at its Waples Building location. Build a weekend getaway around a textile, jewelry or ceramics class at the J. Or enjoy the talents of others by listening to free weekly live music performance in the J’s Piano Lounge Thursday nights from 6-8 and Wednesdays at noon. To explore beyond Front Street, bring your bicycle. 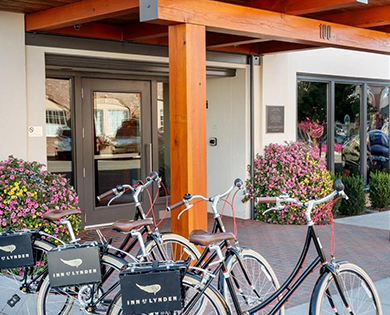 If you’re staying at the Inn at Lynden, they offer a bike valet service or borrow one of the Inn’s touring cycles. Ask front desk staff for a bike map, which details routes to local trails and treats. Polite local drivers will yield the right-of-way for cyclists who pedal the 10-minute route to Edaleen Dairy’s Grover Street location. Buy a soft-serve cone made with milk from local dairy cows for $1.75. 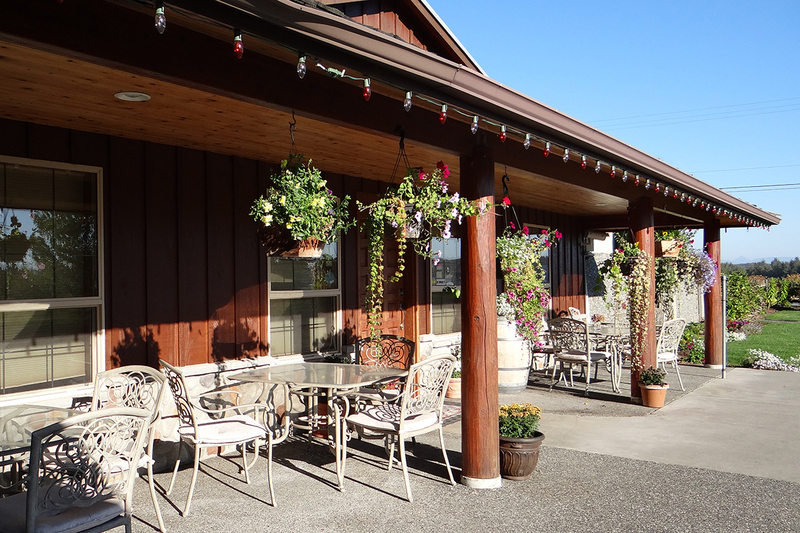 The tasting room terrace in bright sunshine with hanging baskets is a perfect place to spend a summer afternoon. The covered patio pictured in the fading light of sunset is a great venue for a reunion or wedding event. Wines made from the estate vineyard have a reputation as easy drinking and true to the fruit. 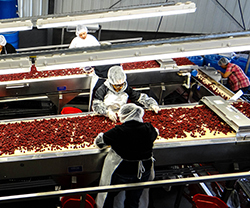 The dedicated staff carefully selects the berries that will wind up in Samson's signature fruit wines. Quite literally, the fruits of their labor results in some of the state's finest dessert and berry wines. Want a bit more of an adventure? 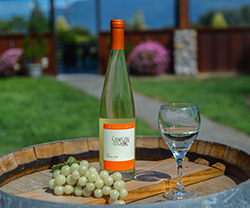 Pedal the flat, rural roads over the Nooksack River and past farmland with stunning views of Mount Baker to Samson Estates Winery. 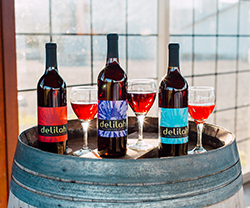 The third-generation, 600-acre berry farm owned by winemaker Rob Dhaliwal handcrafts artisan dessert and fruit wines from their own raspberries, blueberries, marionberries and hazelnuts as well as viniferous wines from Washington state grapes. Their easy-drinking, true-to-the-fruit raspberry wine, cassis and framboise are award winners. Tasting room host Barb Maleng credits superior fruit. “We ferment directly from the fields, with the fruit oozing juice, direct into tanks,” Maleng says.